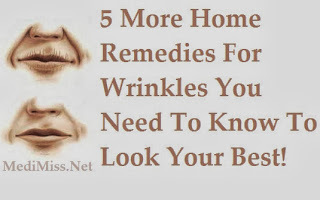 MediMiss cures for wrinkles Home Remedies home remedies for wrinkles Natural Remedies Remedies Remove Skin Wrinkles Skin Care Skin Care Remedies useful remedies wrinkles wrinkles massage wrinkles misting 5 More Home Remedies For Wrinkles You Need To Know To Look Your Best! 5 More Home Remedies For Wrinkles You Need To Know To Look Your Best! While aging may be a part of life, we all want to look our best at any age. Discover these powerful and useful remedies to put off wrinkles as long as possible. 1) Papaya Home Remedies for Wrinkles! The enzymes in this fruit can remove the top layer of dead and dying skin to reveal the younger looking skin underneath. Mix one tablespoon of oatmeal with two tablespoons of papaya, one teaspoon of facial quality clay, one teaspoon of olive oil, one teaspoon of honey, two drops of lavender essential oil and enough water to make a mask. Apply to your face for 10 or 15 minutes and scrub it off with a cloth. 2) Vitamin C and E Home remedies for Wrinkles! While air and oxygen are vitally important for life, it is this same oxygen which causes aging. Just as when you leave a cut apple out in the air it will brown this same oxidation happens inside our bodies. To fight this you need antioxidants. Vitamins C and E are two very powerful antioxidants. You should also be sure to get enough selenium as it enhances these vitamins power. 3) Misting! As we age some of our bodily functions decrease. One of these is our skins ability to hold moisture. Get a bottle with a sprayer that can make a very fine mist. You should spray your face 4 times daily. Begin when you wake and about every 4 or 5 hours until bed. 4) Massage! First mix a essential oils for massage. One ounce of olive oil with three drops of sandalwood and two drops of lemon oil. Massage the forehead and underneath the eyes, but be sure not to get into the eyes. Do this three minutes a day. 5) Meditation! Learning meditation techniques not only helps reduce stress which is helpful in the fight against wrinkles, but with the use of imagery you can harness the power of the mind. Some of you may see imagery as non-sense and that is really too bad. You really limit your possibilities when you fail to use this useful tool. While doing a meditation session simple imagine the body you want. The more vivid a picture you can create the better. Imagine that body is your reality.